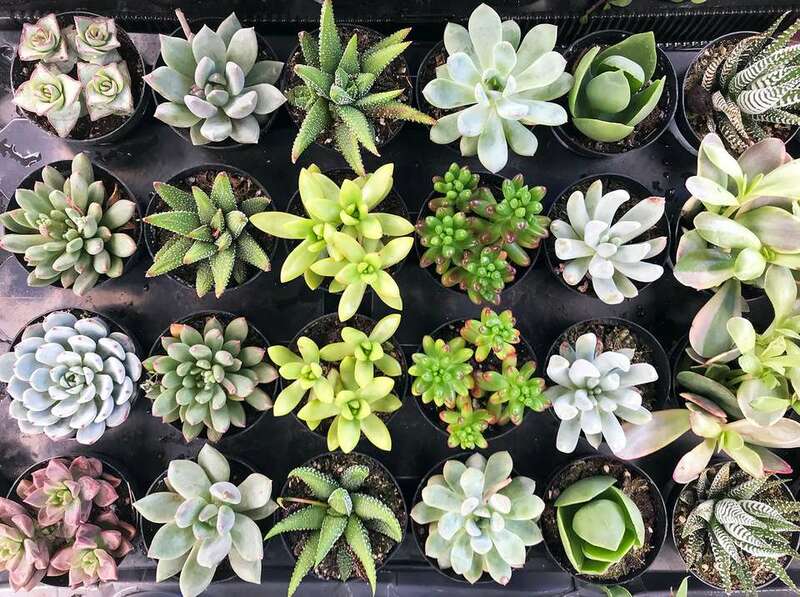 The term succulent refers to a group of plant orders that store water in fleshy leaves and stems. The various types of cactus are one type of succulent, but not all succulents are cacti—the terms are not interchangeable. For a succulent plant to be considered a cactus, it must have areoles—small mounds of flesh where the spines, leaves, and flowers sprout. Cacti, therefore, are just one subdivision of the large group of plants that known as succulents. Some plants groups, such as the agave and yucca, are often considered cacti, but actually fall into different succulent groups. Because they have evolved to store water in their leaves and stems, cacti and other succulents tend to be plants that are native to deserts and low-moisture environments. But these are by no means plants that are grown only in these environments. Many succulents make excellent landscape plants for any environment. They come in a wide range of sizes and forms, from tiny plants best-suited for miniature garden arrangements to giants such as the saguaro that is too big for most landscape applications. Succulents tend to have leaves with leathery texture, but not all plants with this feature can be considered succulents. Montauk daisy and bitterroot, for example, are not succulents. Moss roses (Portulaca grandiflora) are small annual succulents with small rose-like flowers that appear on matts of fine-textured fleshy leaves. Portulacas grow from 3 to 9 inches high and flower throughout the growing season and readily self-seed in the garden. The flowers are neon-bright shades of white, purple, yellow, orange and white; the blooms close up during cloudy, rainy weather. Moss roses are a good choice for areas with poor soils, and they can stand up to a pounding sun all day long with only occasional watering. They are also popular in hanging baskets, with a prostrate growth habit allowing them to cascade down the side of a container. Purslane, an edible weed, is another type of portulaca. Hen-and-chicks, (Sempervivum tectorum) is a mat-forming perennial succulent that produces clusters of rosettes. The parent rosettes are the "hens," and the smaller rosettes that spring from them are the "chicks." This low-growing (4 inches tall) perennial will quickly spread to 2 feet or more in width. Although grown for its leaves, the hen and chicks plant does flower in June and July with reddish-purple blooms. The plant is best grown in USDA hardiness zones 3 to 8. 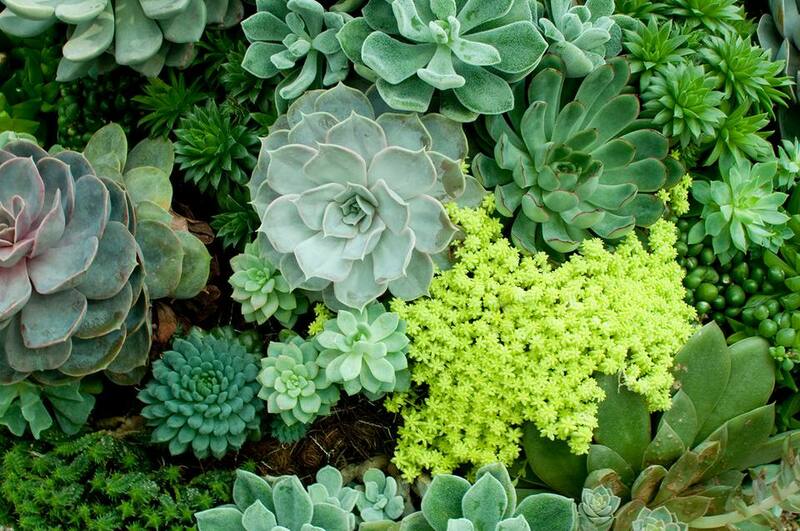 Also known as stonecrops, Sedums represent a large group of perennial succulents that can be grown in many environments, not just arid conditions. This form, Sedum spectabile 'Autumn Joy,' is one of the larger types, growing to 24 inches. Unlike many succulents, Autumn Joy is very much grown for its flowers, which appear in clusters of tiny red or purple flowers that appear in September and October. Autumn Joy prefers full sun to partial shade and well-drained soil. A popular plant for xeriscaping, it's a good candidate for rock gardens. It is suitable for USDA hardiness zones 4 to 11. Note: This plant has recently been reassigned as Hylotelephium 'Herbstfreude' Autumn Joy. You may see this plant referred to and either a Sedum or a Hylotelphium. Sedum erythrosticum 'Frosty Morn,' like several other sedums, has variegated leaves. The name of this perennial sedum cultivar refers to the white tinges on its otherwise green leaves. 'Frosty Morn' is grown primarily for its foliage. It grows to 1 foot tall​ and produces white or pale pink flowers in September and October. 'Frosty Morn' is suitable for growing in USDA hardiness zones 3 to 9. It is an excellent low-maintenance plant. The gold flowers that emerge in spring on Angelina sedum can be a nice bonus added to the appeal of its chartreuse foliage, as long as you don't mind the rather gangly stems they bloom on. But for many, the chartreuse foliage of these succulents is the main reason to grow them. Mass the plants together for use as a groundcover or short perennial border. It is suitable for use in USDA hardiness zones 5 to 8. Sedum rupestre 'Angelina' spreads over time that can be somewhat invasive, so if you prefer plants that are very well behaved, you may wish to avoid this one. With a common name like "Dragon's Blood," one expects a lot of color out of this sedum. But how much color you get depends on the amount of sunshine you give it, among other factors. The Sedum spurium 'Dragon's Blood' is a mat-forming sedum that grows to 6 inches and produces pink-red flowers in June and July. Other cultivars include 'Bronze Carpet," which has bronze foliage and pink flowers; 'Fuldagut,' which has reddish foliage and scarlet flowers; and 'Tricolor,' which has leaves with pinkish-white margins. Sedum spurium grows well in USDA hardiness zones 4 to 9. Ice plant (Delesperma cooperi) is a somewhat more tender perennial succulent, suitable for growing in USDA hardiness zones 6 to 10. It is a spreading evergreen succulent that grows to 3 to 6 inches in height. Glossy red-purple flowers appear in June to September. The common name "ice plant" derives from an optical illusion caused by the way light bounces off tiny hairs on the surface of the plant's leaves. Yuccas are a large genus of perennial plants, shrubs, and trees known for their spiky, sword-like leaves. Large forms can grow to 8 feet in height, but dwarf forms can make excellent landscape plants. Yucca harrimaniae x nana grows to only about 1 foot high and produces spikes of creamy white flowers. Yucca filamentosa, commonly known as "Adam's needle," grows to 2 to 3 feet and produces white flowers in early summer. Yuccas are typically suitable to grow in USDA hardiness zones 5 to 10. Joshua tree is another form of yucca. The plant was named by Morman pioneers, probably in reference to the Book of Joshua in the Old Testament (8:18–29). The passage states that a Hebrew army, wielding javelins (on an order from God to "stretch out the javelin that is in your hand"), took the city of Ai and "raised over it a great heap of stones." The name likely derives from the stony landscape of the Mojave as well as the trees' outstretched arms and javelin-tip leaves." Native to the Mohave desert, Joshua tree is an adaptable landscape plant for USDA hardiness zones 6 to 8. It is the largest of the yuccas and can grow as high as 40 feet over its 100-year lifespan. In home landscapes, it usually grows no more than about 8 feet in height. Unlike other yuccas, Joshua tree forms a scaffolding of trunk-like stems from which the clusters of spiky leaves sprout. The species in the Agave genus are plants that form thick pointed leaves arranged in ​a rosette pattern. The leaves usually end in a spine, which sometimes causes these plants to be considered cacti. These are not cacti, though, but another type of succulent. There are many species of agave suitable for landscape use, with some forming short artichoke-like leaf clusters, and others with long tendrils. Many have attractive blue-gray foliage. The appeal of the agaves is in their symmetrical leaves, not the flowers. Most species are suitable only for warm environments, but a few can be hardy up to USDA hardiness zone 5. Agave havardiana, Harvard century plant, for example, is suitable for zones 5 to 10, and grows to about 30 inches tall. Prickly pear cactus (Opuntia compressa) is one of few cactuses that do well in cold climates. Prickly pear grows well in zones 4 to 9. It grows to about 1 feet in height with clumping pad-shaped stem segments that are sometimes mistaken for leaves. Sharp spines and tufts of hair cover the pads. Bright yellow flowers 2 to 3 inches in diameter appear in June and July. The plant also produces an edible red fruit. Related to the prickly pine, the cholla cacti are a group of intimidating plants that are densely covered with very sharp spines. These are not plants for the faint of heart, or for families where there are children or inquisitive pets. They can make very interesting specimen plants in the right garden, however. There are species ranging from low clumping groundcovers to upright plants growing 6 feet or more. A few species are ​quite cold hardy, surviving down to -25 degrees Fahrenheit. Some types of barrel cactus plants are popular as houseplants. But for some of us, houseplants are the furthest thing from our minds when mention is made of "barrel cactus." If you watched Westerns as a kid, you probably recall seeing a thirsty cowboy slice off the top of a barrel cactus to get at the liquid stored inside. It's not just fiction: Some species of Echinocactus barrel cacti do contain a reasonably palatable fluid (or so we're told) that is potable in an emergency. Barrel cactus can fall into either the Echinocactus genus or the Ferocactus genus. They are notable for the thick round stem structure and very sharp thick spines. The various species range from short squat plants to towering 10-foot-tall cactuses. These plants do not tolerate cold temperatures, so outside warm climates (zones 8 to 10), they are grown as indoor container plants. An imposing plant, the saguaro cactus (Carnegiea giganea) is an enduring symbol of Route 66 and the American West. It is native to the Sonoran desert of Arizona and California. This cactus may be too large for most yards, but, with sufficient space, this giant is an impressive addition. Slow-growing and love-lived, suguaro cactus can grow to 60 feet in height over 200 years. After 35 years, it may produce creamy white flowers. In certain areas, this plant is protected by law. Somewhat unusual in residential landscapes, saguaro cactus is sometimes grown as a container plant.